I can't believe we're already on month 3 of the Tattered Lace Challenge! Before we get started with the card, the 'how-to' and what was used, I just want to clarify that we did pick a winner of the Lavish Blooms die set, though unfortunately the winner hasn't got back to me yet. I'll be resending the email to the winner today so keep an eye on your inboxes and I'll announce the winner as soon as I hear back! Right, here we go... here's our entry to the Men & Boys challenge! 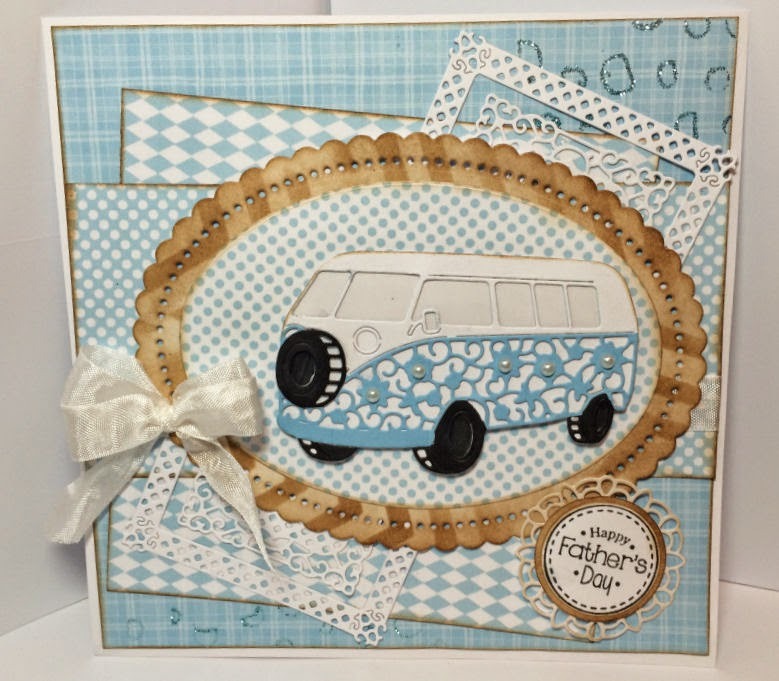 So for this card, I've used the gorgeous Campervan die from the Day's Out collection, I cut it out three times - once from white, blue and then black. I used the white as the base (added acetate behind the windows), blue from the bottom part and then cut out the wheels separately to go on top. I coloured in the centres of the wheels with a Black Graph-it marker. All the papers I've used are from our Forever Florals Double CD which I've distressed around the edge with a Gathered Twigs ink pad. I also used a quickie glue pen through a mask in the top corner and added Twinklies glitter on top! Now for the fun bit... We were lucky enough to get our Elegance Collection #2 dies yesterday (the POW on Create & Craft which includes Haddon, Hardwick, Kedleston and Chatsworth) and of course, we couldn't wait to get playing! I've cut the Kedleston Scalloped Oval from white card and used some masks around the edge, this is a sneaky peek at something that may be coming to us soon! I distressed lightly first, then added my mask and distressed through it in the same colour. I then used the straight Oval to die-cut from patterned paper and added the Campervan on top. I cut the middle & smallest Chatsworth square (just to try it... and then NEEDED to use it!) from white card and cut in half across the centre of each. 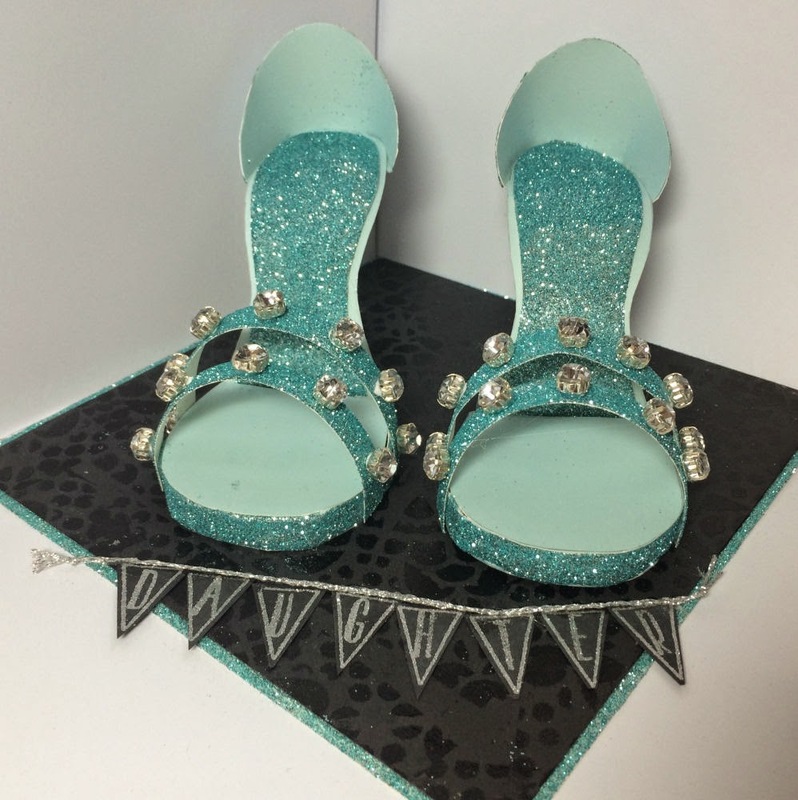 Then I poked them in the opposite corners of the topper image as an embellishment. And obviously, I wanted to use all the new dies as soon as we got them (plus we got our order of the Blush Ebosser yesterday too... which is a dream to work with!) so I used the smallest Hardwick circle, trimmed off the outer edge and used it as a matt for my circle sentiment! 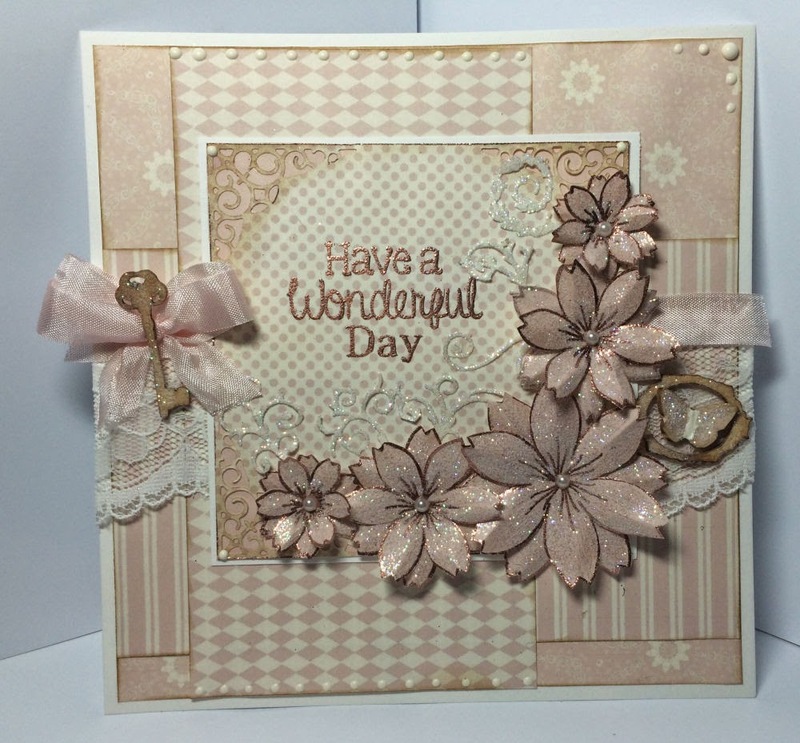 Hope you like the card and be sure to pop over to the Tattered Lace Challenge Blog to enter your card for this months challenge! Sneak peek: 10am, 23rd May! It seems ages since my last post (I'm sorry about that!) - but here I am with a sneak peek for tomorrows show! For this card, I've used papers from the Forever Florals double CD which absolutely FLEW last time we were on (thankyou so, so much for that!) - it's got to be one of my ultimate favourites for the variety of papers and pretty patterns. Each flower has been layered up with the same size twice, each layer embossed with Cosmic Shimmer Ancient Copper powder and glittered with Twinklies. To embellish the arrangement, I've ran some cream paper + sticky sheet through my Jus-Cutz machine, using the gorgeous Florentine Flourishes from Tattered Lace, then glittered again with Twinklies. Also, the entire base plaque which I've used as the focal point is part of the Tattered Lace Elegance Collection Vol. 1 (Specifically, the Westminster die! ), I LOVE it! Hope you like it and I hope you enjoy the show tomorrow! PS. I wanted to post my shiny shoes too... look out for them on the show!